The Organising Committee of the Dutch Land Governance Multi-Stakeholder Dialogue has commissioned an investigation into the need and possibility to develop a protocol on fair compensation in cases of legitimate land tenure changes, with a focus on expropriation. This is in line with the Ministry’s role in the Land Governance Multi-Stakeholder Dialogue. This dialogue involves government, civil society, business, finance and academia. The protocol should serve as guidance for all relevant actors, such as representatives of affected people, governments, project developers, financers, donors and civil society organisation in cases where a fair compensation needs to be assessed. Land tenure changes, particularly relocation, are an impactful process for holders of tenure rights. The duty to avoid or at least minimize displacement is mentioned across a variety of voluntary guidelines, in both national and international legal systems, and in human rights conventions. 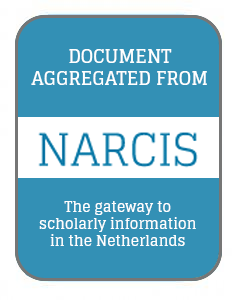 National Academic Research and Collaborations Information System (NARCIS) is the main Dutch national portal for those looking for information about researchers and their work. NARCIS aggregates data from around 30 institutional repositories. Besides researchers, NARCIS is also used by students, journalists and people working in educational and government institutions as well as the business sector.